Preheat the oven to 220oC or gas mark 7. Prepare a baking tray, e.g. greased. Sieve the flour and mustard into the bowl. Rub in the butter or margarine into the flour until it resembles breadcrumbs. Mix to form a soft dough. Place the dough on a lightly floured work surface. Roll out the dough to about 1½cm thick. Shape the scones using a cutter. Place the scones on a baking tray and brush each top with a little milk. Bake for 12-15 minutes, until golden brown. To make fruit scones, add 25g sugar and 75g currants or sultanas before the milk and leave out the cheese. 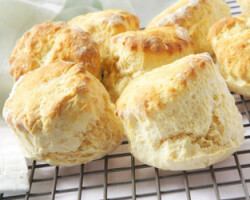 Traditionally, fluted scone cutters are used for sweet scones and plain cutters for savoury scones. You could experiment with different flavourings by adding herbs or spices.